Premier Christy Clark announcing the plan to replace the Massey Tunnel with a new bridge in 2013. The provincial government came under fire again Tuesday for blocking the release of information – this time related to its plan to build a new bridge on Highway 99 to replace the Massey Tunnel. Independent MLA Vicki Huntington raised the issue in the legislature, saying three separate freedom of information requests – two from her office and one from a Delta South constituent – turned up nothing. “The people of B.C. have a right to expect that a $3-billion decision has a paper trail,” Huntington fumed during Question Period. Premier Christy Clark announced the new bridge between Delta and Richmond would be built at the September, 2013 Union of B.C. Municipalities convention. One FOI request directed to the premier’s office for any background material leading up to that announcement didn’t even turn up Clark’s speech. A later request from Huntington’s office targeted background material and technical data that would have helped transportation ministry staff decide on which five configuration options for a new bridge or tunnel would go out to public consultation. Again, “no records were located,” Huntington said in an interview. A third FOI from Huntington sought the business case or cost-benefit analysis, technical reports and correspondence – any of the rationale that should guide such a critical decision. It turned up nothing she was after, just 15 pages of traffic analysis. In fact, there is no business case for the Massey project yet – it was supposed to be complete by the spring of 2014 but is 18 months overdue. Nor is there an estimated price tag, a decision on whether it will be tolled, or a final configuration, although officials suggest it will be 10 lanes. The lack of detail hasn’t stopped the province from embarking on preliminary design and geotechnical work in the meantime and promising a construction start in 2017 and an opening in 2022. Officials said in the spring a project definition report would be released this fall, followed by more consultation. The government’s response to Huntington in the legislature shed no more light on the project. Technology Minister Amrik Virk instead repeatedly suggested Huntington had joined the “Say No to the opportunities” party that opposes infrastructure projects. That prompted the Delta South MLA to say she sometimes wishes she could “bop the members opposite on the head” before being ordered by the speaker to withdraw the comment. The exchange came 10 days after a damning report by the information and privacy commissioner that revealed the government practice of “triple deleting” emails from servers to thwart FOI searches. Huntington said it’s frustrating that the government is avoiding its obligation to keep documents related to major decisions and release them as required. The government’s rationale for the bridge could face more scrutiny in the months ahead. 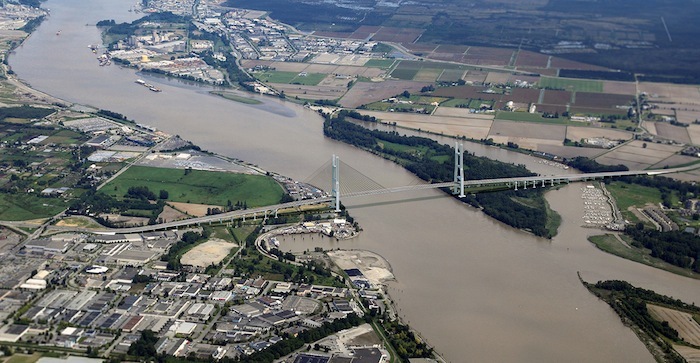 Transportation ministry rendering of what a new bridge to replace the Massey Tunnel might look like.